A monster storm that erupted on Saturn in late 2010 – as large as any storm ever observed on the ringed planet – has already impressed researchers with its intensity and long-lived turbulence. A new paper in the journal Icarus reveals another facet of the storm’s explosive power: its ability to churn up water ice from great depths. This finding, derived from near-infrared measurements by NASA’s Cassini spacecraft, is the first detection at Saturn of water ice. The water originates from deep in Saturn’s atmosphere. “The new finding from Cassini shows that Saturn can dredge up material from more than 100 miles,” said Kevin Baines, a co-author of the paper who works at the University of Wisconsin-Madison and NASA’s Jet Propulsion Laboratory. “It demonstrates in a very real sense that typically demure-looking Saturn can be just as explosive or even more so than typically stormy Jupiter.” Water ice, which originates from deep in the atmosphere of gas giants, doesn’t appear to be lofted as high at Jupiter. Monster storms rip across the northern hemisphere of Saturn once every 30 years or so, or roughly once per Saturn year. The first hint of the most recent storm first appeared in data from Cassini’s radio and plasma wave subsystem on Dec. 5, 2010. Soon after that, it could be seen in images from amateur astronomers and from Cassini’s imaging science subsystem. The storm quickly grew to superstorm proportions, encircling the planet at about 30 degrees north latitude for an expanse of nearly 190,000 miles (300,000 kilometers). The new paper focuses on data gathered by Cassini’s visual and infrared mapping spectrometer earlier this year. The team, led by Lawrence Sromovsky, also of the University of Wisconsin, found that cloud particles at the top of the great storm are composed of a mix of three substances: water ice, ammonia ice, and an uncertain third constituent that is possibly ammonium hydrosulfide. The observations are consistent with clouds of different chemical compositions existing side-by-side, though it is more likely that the individual cloud particles are composed of two or all three of the materials. The classic model of Saturn’s atmosphere portrays it as a layered sandwich of sorts, with a deck of water clouds at the bottom, ammonia hydrosulfide clouds in the middle, and ammonia clouds near the top. Those layers are just below an upper tropospheric haze of unknown composition that obscures almost everything. But this storm appears to have disrupted those neat layers, lofting up water vapor from a lower layer that condensed and froze as it rose. The water ice crystals then appeared to become coated with more volatile materials like ammonium hydrosulfide and ammonia as the temperature decreased with their ascent, the authors said. In understanding the dynamics of this Saturn storm, researchers realized that it worked like the much smaller convective storms on Earth, where air and water vapor are pushed high into the atmosphere, resulting in the towering, billowing clouds of a thunderstorm. 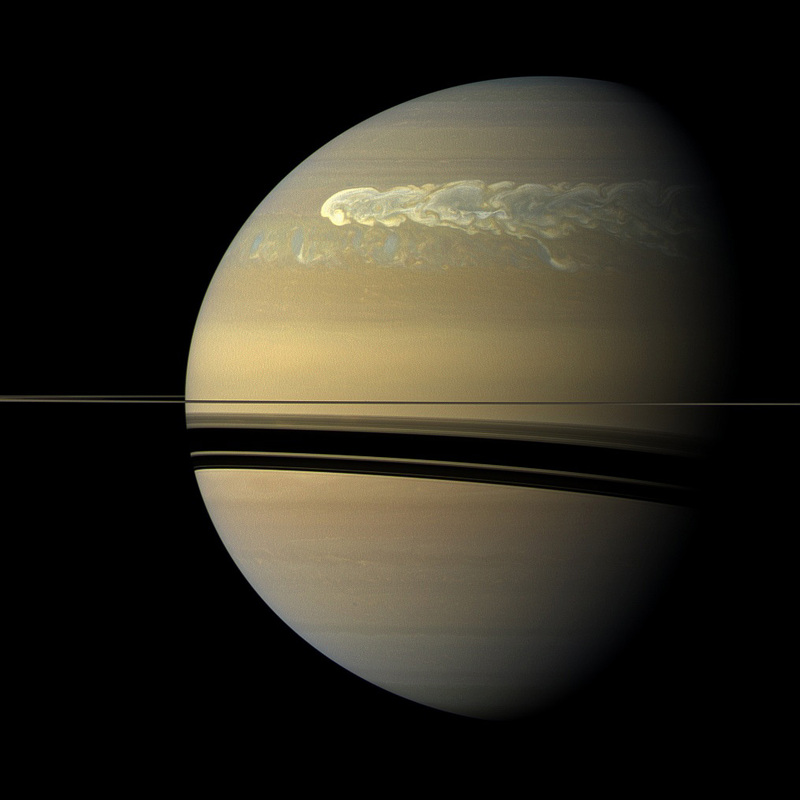 The towering clouds in Saturn storms of this type, however, were 10 to 20 times taller and covered a much bigger area. They are also far more violent than an Earth storm, with models predicting vertical winds of more than about 300 mph (500 kilometers per hour) for these rare giant storms. The Cassini-Huygens mission is a cooperative project of NASA, the European Space Agency and the Italian Space Agency. JPL manages the mission for NASA’s Science Mission Directorate, Washington. The California Institute of Technology in Pasadena manages JPL for NASA. The VIMS team is based at the University of Arizona in Tucson. For more information about the Cassini mission, visit: www.nasa.gov/cassini and http://saturn.jpl.nasa.gov.